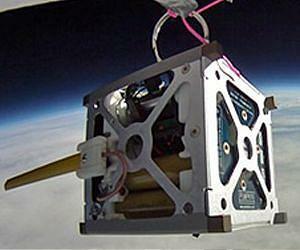 PhoneSat 1.0 during high-altitude balloon test. Credit: NASA Ames Research Center. The fast-paced proliferation and popularity of mobile devices here on Earth, like smartphones loaded with powerful operating systems, will find a new niche marketa euros ” this time in space, thanks to NASA’s trailblazing PhoneSat project. To be rocketed into space early next year, PhoneSat is set to showcase use of lower cost, off-the-store-shelf, commercially available technology that enables space commerce, educational activities and citizen-exploration. “PhoneSat demonstrates a philosophy of taking a creative idea, then building and testing that inspiration in a very rapid way…as opposed to long planning processes typical of larger spacecraft programs,” said Andrew Petro, NASA program executive for Small Spacecraft Technology within the Space Technology Program at NASA Headquarters in Washington. Read more: PhoneSat: Smart, Small and Sassy — Space Daily.